Dean Giannakis has done it again. St Gerry’s fans can, as of last month, grab those bite-sized honey-drizzled delicacies in Oakleigh. 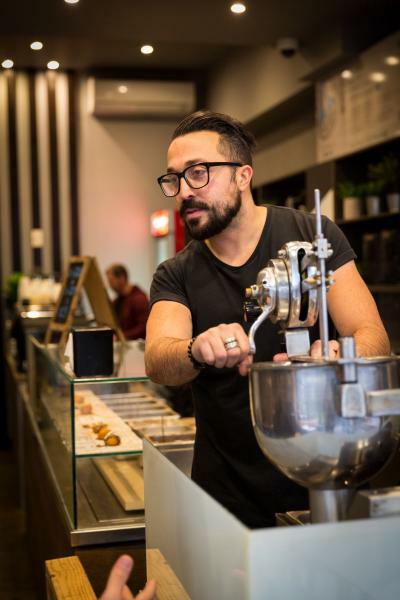 Indeed, Melbourne’s favourite doughnuts now have a home, in the heart of the Greekest suburb. St Gerry’s – the business that revolutionised dougnut culture as the pioneers of the modern Greek loukoumades in Melbourne, are serving scrumptious treats every evening except Mondays and all day long on weekends, tantalising our tastebuds with modern and traditional flavours, not to mention amazing coffee. “I have added that. 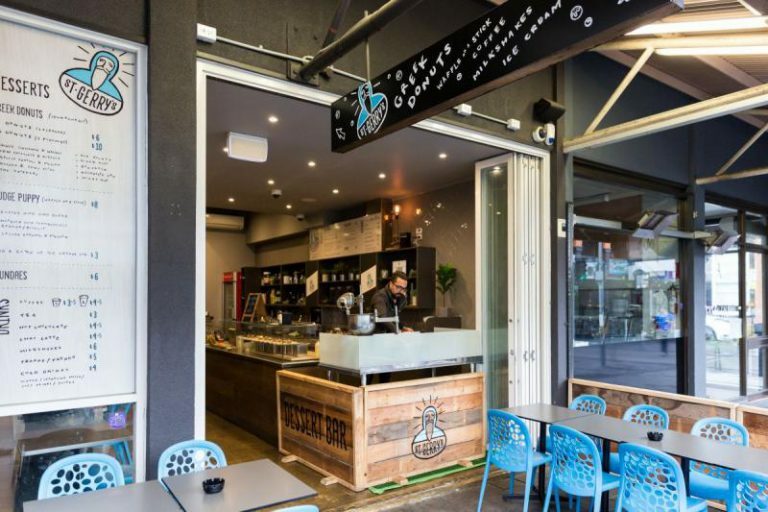 A full range of Melbourne-style and Greek-style coffee. Freddo espresso, freddo cappuccino and, of course, frappé,” Dean Giannakis tells Neos Kosmos. The much-anticipated shop has been received with excitement, with sweet-tooths lining up for at least one hour before every opening to secure the first loukoumades of the day. For the time being, St Gerry’s will keep serving their desserts at night with Friday through to Sunday being their longer days of trade, but the owner promises to extend opening hours when the warmer weather hits Melbourne. “It’s been amazing. Every single day it is so busy; I can’t even begin to describe how busy, but I’m loving it. It was during the local feasts and celebrations of the patron saint of Kefalonia, Saint Gerasimos, that Dean discovered the delights of the island’s incredible food. In wanting to bring this side of Greece to Melbourne, St Gerry’s was born. “Many natives of the island name their children after Saint Gerasimos as a tribute to the saint who protects them. “My tribute to him is to honour his memory using his name so it’s never forgotten and by creating delicious dessert treats which will undoubtedly heal you of your hunger,” he laughs. His artisanal crispy and fluffy loukoumades don’t leave much room to question St Gerry’s ability to create both delicious and impressive desserts that will satisfy even the most demanding foodie. The menu includes several imaginative doughnut variations and different versions of fudge puppy – AKA Belgian waffle on a stick. 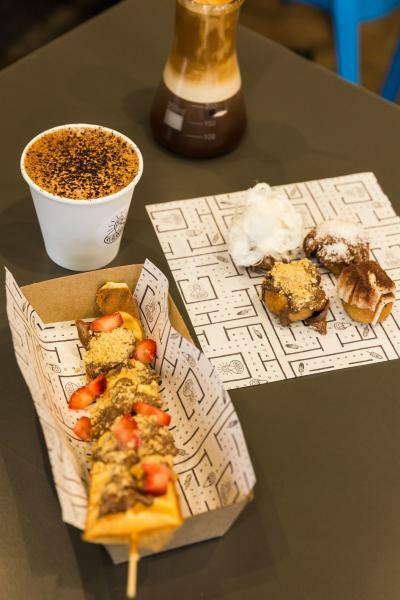 Some of the flavours on the dessert bar’s ever changing menu include: hazelnut chocolate and yiayia’s crumbed biscuits; salted caramel and popcorn; their take on the Snickers bar; raspberry coulis-filled loukoumades and many more. “Prepare your tastebuds for a number of mind-blowing flavoured treats,” he says, insisting that we have to try all the doughnuts, while he prepared his dough from scratch. “Every day, we start fresh. We open at 5.00 pm in the afternoon and each item on our menu is made to order right in front of the customer, with our doughnut machine,” Dean enthuses. Apart from the standard flavours, remember that you are always free to experiment with recipes, creating your own versions of St Gerry’s desserts. “We enjoy getting feedback from our customers. It makes us better,” he says. It was that same feedback that encouraged Dean to open up a physical store – and at a central location like Eaton Mall. After every St Gerry’s-attended event there would be a review asking for a standard location, or people commenting about how sad they were they had missed the cart, wondering when they could catch them again. “From the first few weeks of launching my business, people kept asking ‘where’s your shop?’ so, after continuously growing and building the brand, it was time to open and where better than in the heart of Oakleigh on Eaton Mall?” Dean enthuses. Greece has its own iced coffee culture and Dean definitely had the know-how. He decided to offer that option as well, but he has elevated the quality the Melbourne way. “After testing numerous coffee roasters, we selected to team up with Code Black,” he says. We will have to agree. Note: Don’t leave St Gerry’s without having a taste of the new bougatsa custard-filled doughnut with sugar syrup, cinnamon, icing sugar and crushed filo pasty on top. Plus a flavour to take you back to your childhood: Milk and Milo. Their Greek-style Freddo Cappuccino is a killer too. * St Gerry’s will still keep serving the masses at Victoria’s biggest food truck carnivals, festivals, events, night markets and private catering. The team are also available for private functions and event hire, so contact them to organise a booking. Dean is also in the process of expansion in both St Gerry’s mobile set-ups and stand-alone dessert bars so stay tuned . . .